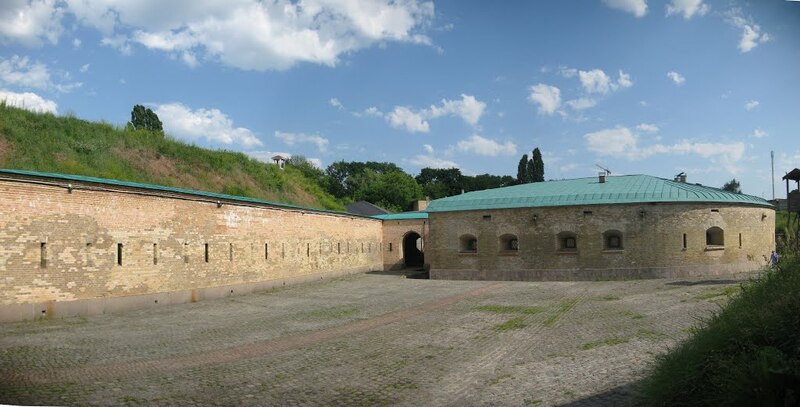 – Hospital fortification – is a part of the architectural complex “Kiev Fortress”, it is a semi-underground construction. There are embrasures and loopholes, as well as guns that are represented on the perimeter of the caponier. 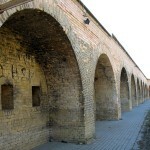 The fortification was erected in 1844. It includes the defensive structure “Oblique caponier”, located at an angle to the earthen rampart of the fortress. There is also the northern half-tower, the northern gate with a caponier, a military hospital with a tower, a caponier of 1-3 polygons in the hospital fortification. They all preserved to this day. It is considered to be the largest preserved stone-earth fortress in Europe and the second largest in the world. 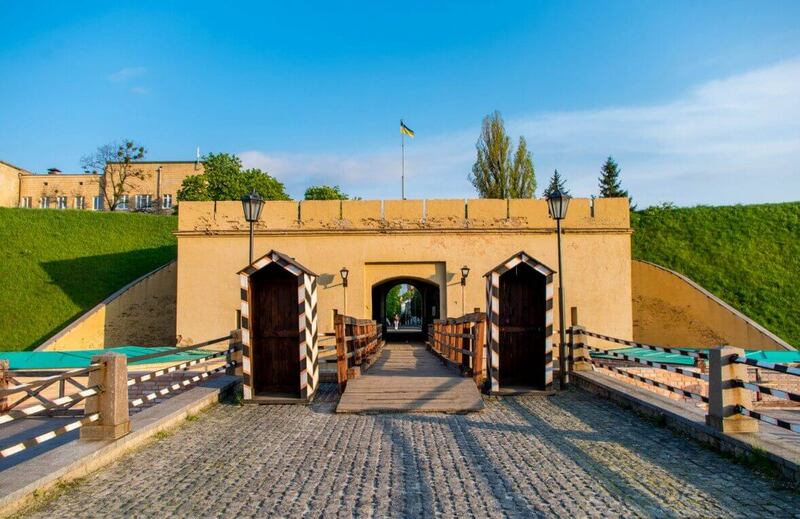 – Ramparts of the 1st moat – is part of the Hospital fortification of the New Pechersk Fortress. The main rampart of the fortification was piled during the period of 1842-1845, but some works were continued in 1849. Ramparts and moats were the main obstacles for the enemy troops carrying out the assault on the fortification. In this regard, the shaft was poured around the perimeter of the fortification, with the exception of the rear part. In this part, it did not fill into to facilitate the counter-attack by the garrison of the fortress on the fortification, in case of its capture by the enemy. On the rampart under the shelter of the parapet were fortified artillery and infantry. The length of combat positions on the rampart was 1 km 195 m.
– Fortress wall – is a brick defensive wall erected at the foot of the rampart, as an additional barrier for enemy troops. The wall had numerous gun loopholes, through which soldiers of the garrison could fire on the assault troops. 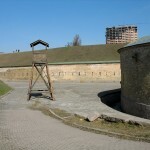 – Northern Gate (with the caponier) – built in 1843-1844, through which the passage through the main rampart of the hospital fortification was carried out. The passage of the North Gate is made in the form of a tunnel, laid inside the ramparts. Inside the passage on both sides there were ladders along which soldiers of the garrison could descend to the lower floor of the gate. The gates were erected in the rampart of the Northern Front of the Hospital fortification for shelling, but soon they were used as a workshop for the hospital. Preserved until our days, reconstructed (Hospytalna Str., 18). – Northern semi-tower – a defensive structure with embrasures and loopholes, built in 1839-1842 and served as a cover for the approaches to the North Gate of the Hospital fortification. In the two-storeyed building of the Northern semi-tower of the form of a semicircle there was barracks for 58 casemates. 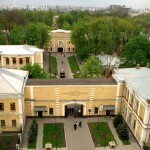 At the end of XIX century here was located the Kyiv military paramedic school. It was reconstructed (Hospytalna Str., 16). 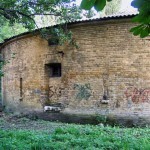 – Hospital – military hospital with a bath-house, built in 1836 – 1844. The two-storeyed building of the hospital as a component of the front of the Hospital strengthening was designed for 1,5 thousand people. 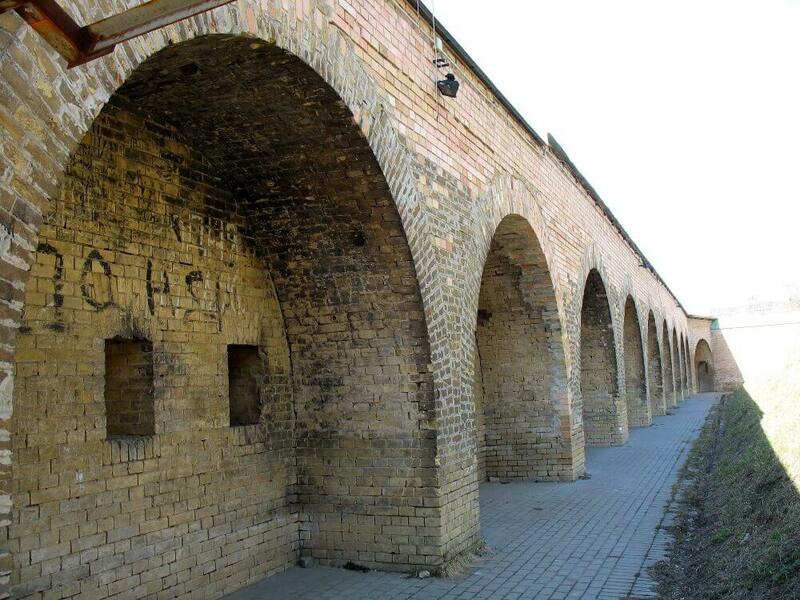 A small one-storeyed building of the bath-house (1839-1842) consisted of several rooms, covered with stone arches. In the second half of the XIX century the water tower was built up. The hospital was distinguished by a high level of sanitary and technical equipment and amenities. There were bathrooms with warm water and toilets, and under the baths sewer channels were designed. In 1845 a garden was laid out in the courtyard of the hospital. In addition to the main goal, the corps played an important role in the defence of the fortification. The buildings of the baths and the hospital, as well as the defensive walls that connected them, formed a bastion front inside the fortification, which would allow keeping on the battle in the event of the capture of the main rampart. The facades were equipped with artillery embrasures and loopholes. Also there were gates for passage. Today, in the buildings of the former hospital, there is a military medical institution ( Hospytalna Str.,16). 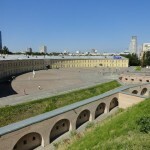 – Central Caponier – part of the Hospital fortification of the New Pechersk Fortress. Defense fortification was divided into three polygons and two fronts – the North and the Rear front. 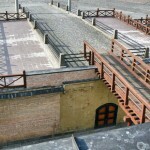 A feature of the defensive system were the caponiers – buildings of a casemate type, intended for conducting artillery firing along the moat in two directions. The central caponier was a rectangular room with arches resting on the walls and 4 internal pillars, in the centre of the room – equipped places for storing ammunition. The caponier was adjacent to the counter-cracker of the moat (the furthest slope of the moat) and its covering served as the support of the lifting bridge leading to the North Gate of the fortification. The caponier had no direct communication with the internal part of the fortification – it could be accessed through the bottom of the moat through the passages in the defensive walls of the courtyards of the I and II polygons. 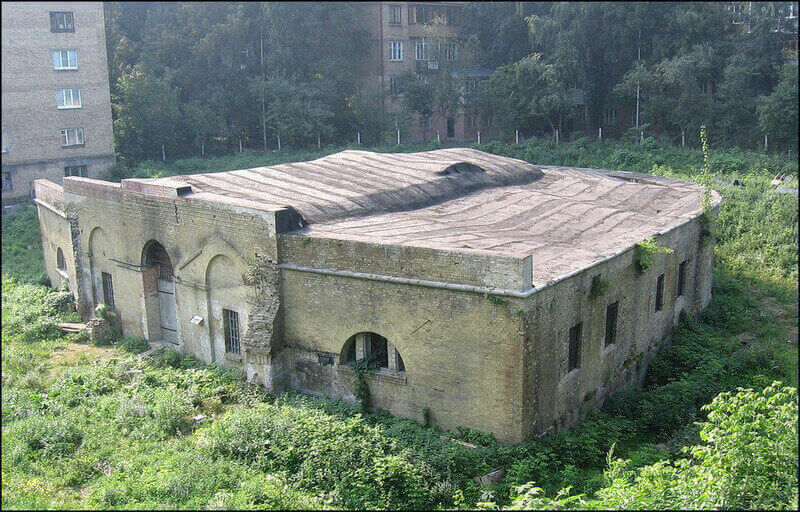 – Caponier of the 1st polygon – part of the Hospital fortification, built in 1843-1844 at the bottom of the fortress moat for firing along the rampart of the 1st reinforcement polygon (Laboratorna Lane, 24). The brick structure consisted of two facets at an angle and a straight horizon front. In the centre of the caponier was a powder chamber for 1.13 thousand poods, along the perimeter of which casemates were located. The battle casemates, located in the front part of the caponier, had an artillery embrasure and two gun loopholes. To communicate with the caponier in front of him in the depths of the ramparts was a tunnel. In the walls connecting the rear part of the caponier with the defensive wall of the rampart, there were gun loopholes and lifting bridges to enter the moat, which allowed the artillery fire from the caponier to be filled with gunfire and to concentrate the infantry for counterattacking (not preserved). Through the tunnel, soldiers of the garrison exited behind the defensive wall of the rampart to fire. Initially, the caponier of the 1st polygon was intended to house a bakery and a warehouse of hospital personnel. 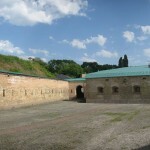 In 1863, the caponier served as a prison for the participants in the Polish uprising, since 1865 – for the deployment of troops, later – the warehouse of the quartermaster department. Some loopholes and embrasures on the facades were spread under the windows. 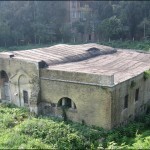 – Caponier of the 2nd polygon – part of the Hospital fortification (Hospitalna Str., 24-a). It was built in 1843-1844 and is located at the bottom of the moat, intended to fire along the rampart of the 2nd reinforcement polygon. In the centre of the caponier was a powder chamber, along its perimeter were built battle casemates, in the rear – a room through which one could get into the casemates and the powder chamber. is Caponier of the 2nd polygon constructed similarly to the caponier of the 1st polygon. Overall, the caponiers had 11 artillery embrasures and 6 gun loopholes. To communicate with the caponier, there was a tunnel through which the garrison was also exited behind the defensive wall to conduct a gun fire. In the walls that connected the rear part of the caponier to the defensive wall of the rampart, there were gun loopholes and lifting bridges, which allowed the artillery fire from the caponier to be supplemented with gunfire from behind the wall and concentrate infantry in the courtyard for a counterattack. 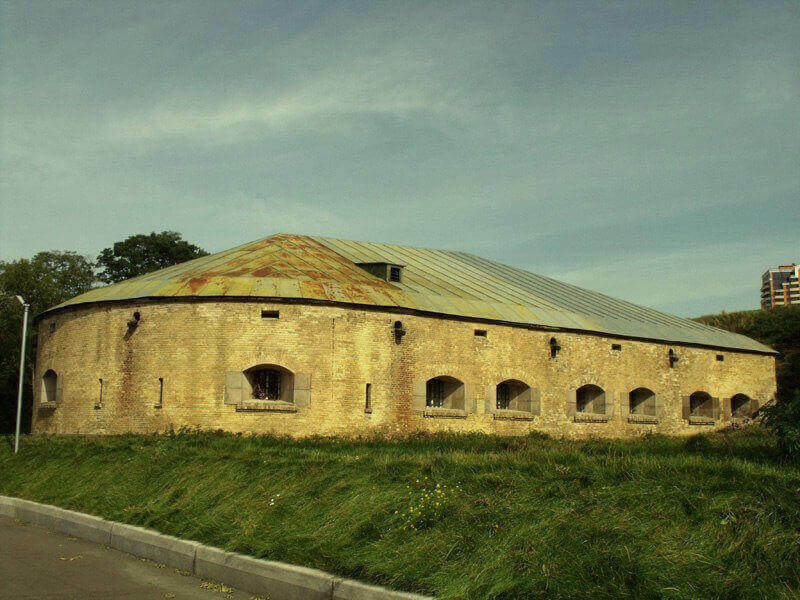 Initially, the caponier of the second polygon served as a repository for shells of the fire department of the Kyiv artillery warehouse, since 1863 – a prison, and later it was used as a warehouse. 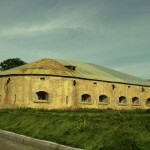 – Caponier of the 3rd polygon – part of the Hospital fortification of the New Pechersk Fortress. It was built for longitudinal firing moat in 1844-1846 similarly to the caponiers of 1st and 2nd polygons under a single plan (Hospytalna Str., 18). Initially, the caponier of the III polygon served as a laundry for the hospital nurses and warehouses for property. Since 1863, it was adapted to prison, later it was used as a warehouse. 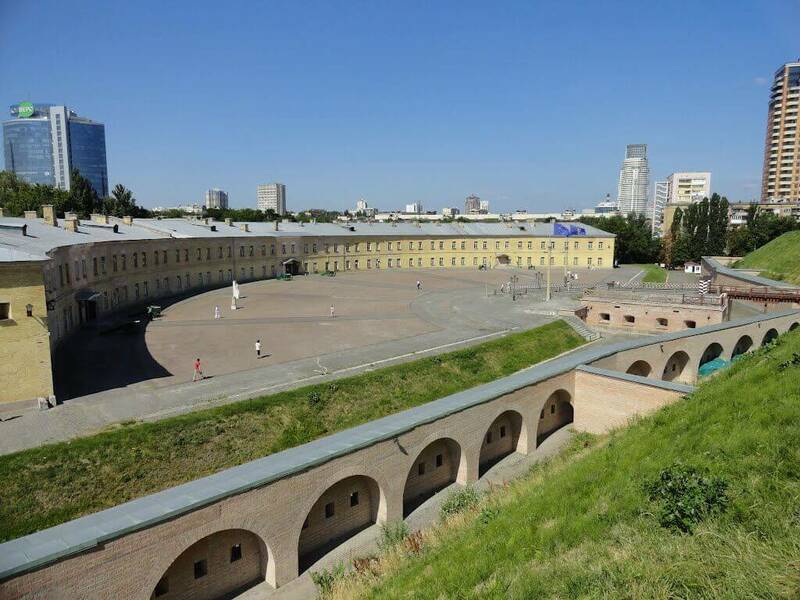 – Kosyi Kaponir (Oblique caponier) – part of the Hospital fortification of the New Pechersk Fortress, built in 1844-1846 to protect the north-west corner of the fortification under an individual project with enhanced weapons (Hospytalna Str., 24-a). 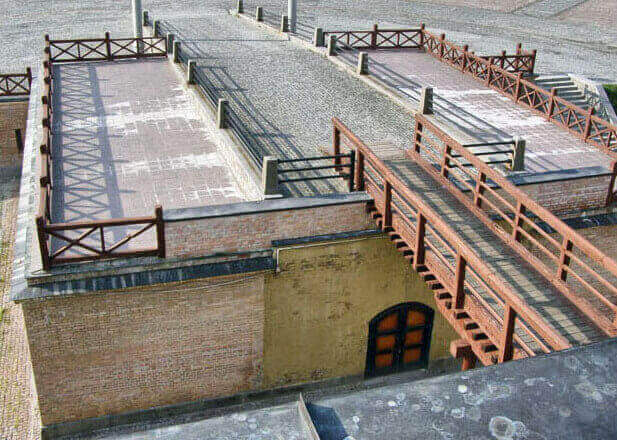 It was located at an angle to the moat line, therefore it was called “oblique caponier”. 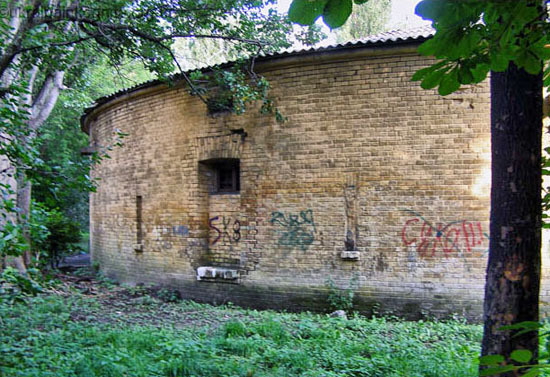 The feature of “oblique caponier” is that it locates on the slope of the Cherepanova hill, and not in the moat, like other caponiers. It represented a semi-subterranean construction of a parabolic configuration from the outside, brick walls were cut by embrasures for cannons and loopholes for guns. Caponier had 15 artillery embrasures, 6 gun loopholes and a powder chamber of increased size. In addition, it did not have battle casemates, separated from each other by the capital walls, as in the caponiers of I, II, III polygons. Glacies have also been built-gently sloping to improve the conditions of firing ahead of the lying terrain and to protect the fortification from the west. Caponier’s vaults rested on the outer walls and walls of the powder chamber, resulting in a single casemate, encompassing the perimeter of the powder chamber. Connection with the caponier was carried out through a tunnel, the entrance to which was located in the counterscarp of the fortified moat. 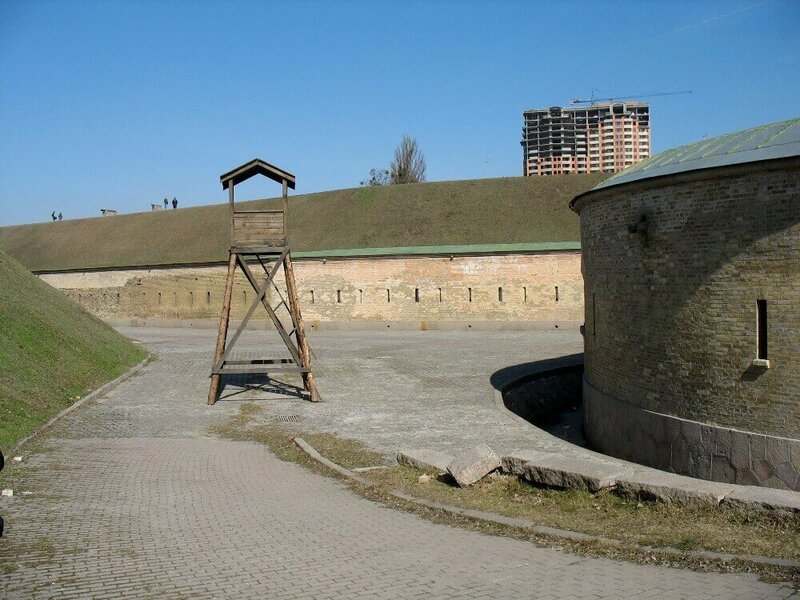 Since 1863 the Kosyi Kaponir was used as a prison for prisoners of the Polish uprising. Here, single and mass cells, two punishment cells and a guardroom were set up. Within its walls were participants of an armed insurrection of November 18, 1905, as well as soldiers of the 41st Selinginsky Infantry Regiment and the 21st Sapper Battalion of the uprising of July 4, 1907. 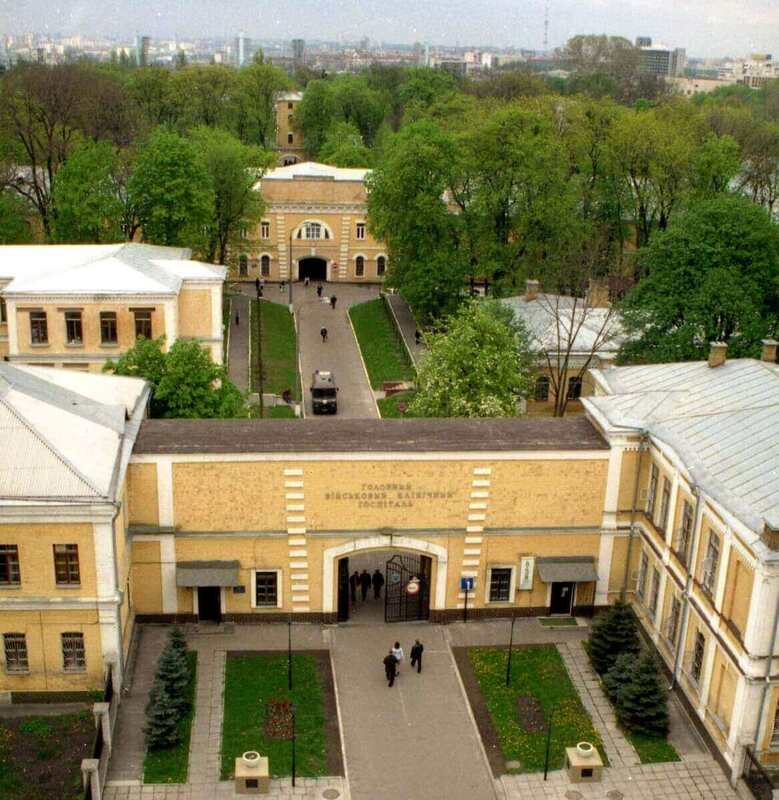 For a harsh regime, the military-political prison “Kosyi Kaponir” was nicknamed ” Kyiv’s Shlisselburg “.